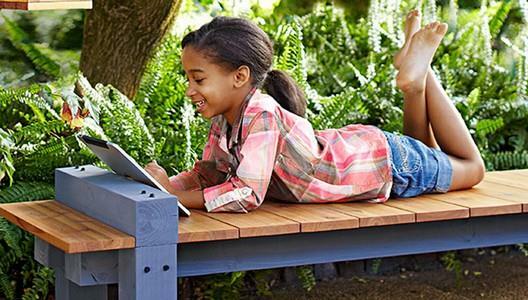 Build a great outdoor bench for your patio or even around a tree with free plans. 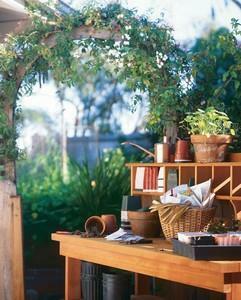 Plans for potting benches, tree benches, planter benches, deck benches, garden benches and more outdoor bench plans. 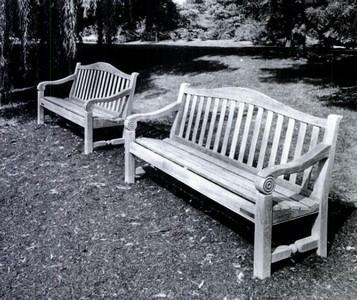 Click here for Indoor Bench Plans. This handsome ten feet long wooden bench is designed to be placed on top of ceramic pots that are at least eighteen inches tall. 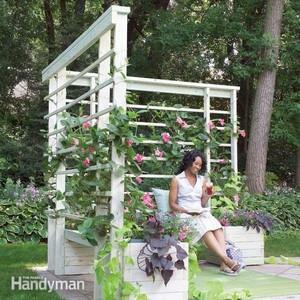 Make a beautiful seating area using this plan for an "L" shaped bench with a planter on each end plus an arbor connected to the back. 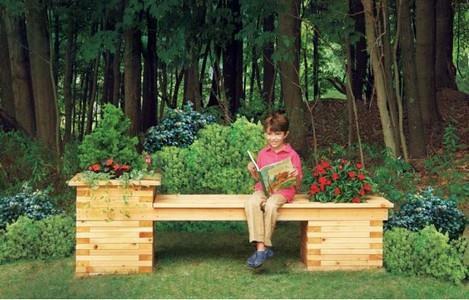 You can easily create a strong and sturdy seating area using stacked cedar wood and this planter bench plan. This is a plan for an attractive garden bench that offers a large working surface, two lower shelves, deep slide out bin and more. 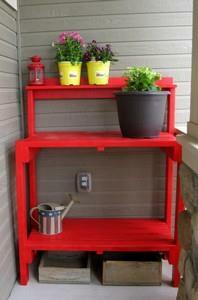 Build a bench out of 2 wooden pallets. 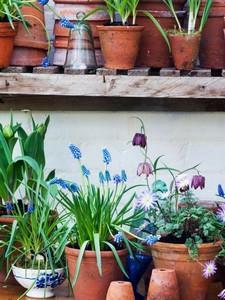 This bench has a bottom storage shelf, spacious counter area and a place to hang pots. 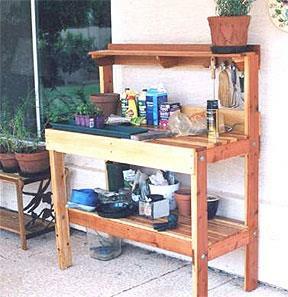 Here is a project for a strong and sturdy bench with an upper and lower shelf, work surface and hooks for hanging gardening tools. 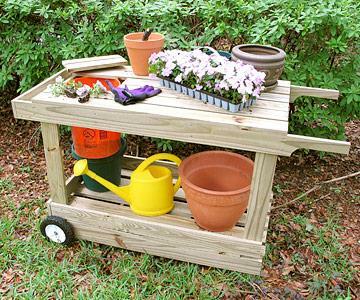 This portable bench has 2 wheels on one end and 2 handles on the other which makes it a bench and a cart all in one. 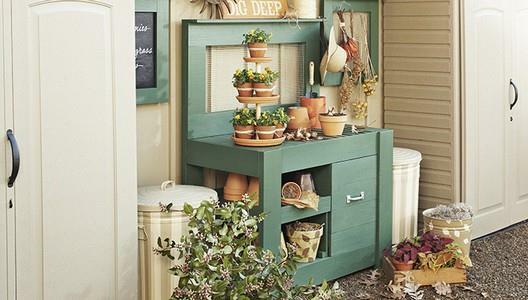 Build a garden workbench that has a place for most everything. This bench has cubby holes, storage shelves and more. 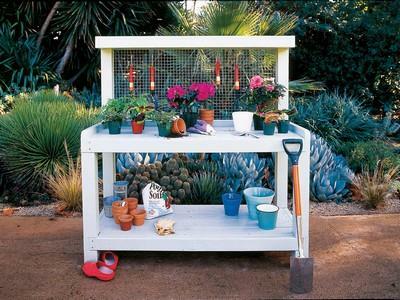 Create the perfect work area for potting plants with this built-in bench with a big work counter and built-in shelves above. 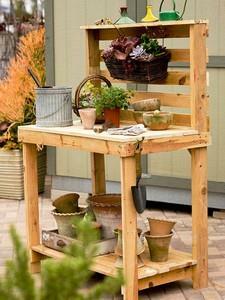 Here is a plan for a simple garden bench that offers a roomy potting surface, large storage below and handy shelf above. 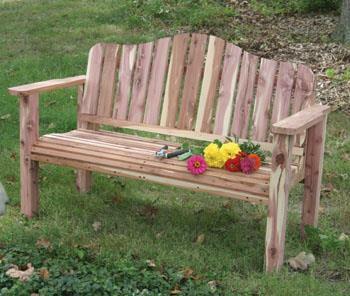 You can build this sturdy bench or a couple benches in an afternoon. This is a great project for the intermediate woodworker. The table shown measures 5 feet long, but dimensions can be changed to suit your needs. It even has a screen back to hang your tools on. 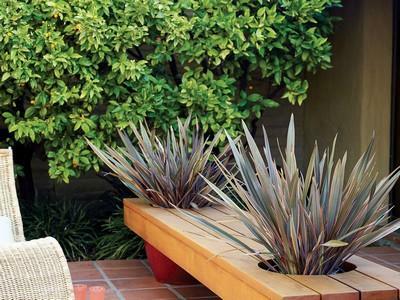 Create additional seating for your outdoor space by building these rustic benches. 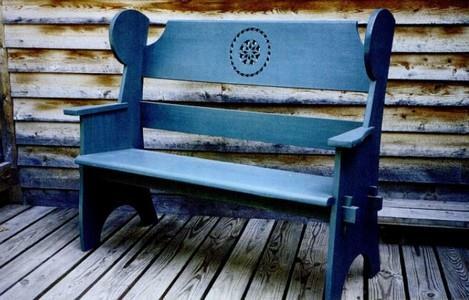 Garden benches can range from classic designs requiring a fair amount of materials and woodworking expertise to simple slab benches that require little effort, can be built from scrounged materials and add a rustic appeal to yards. 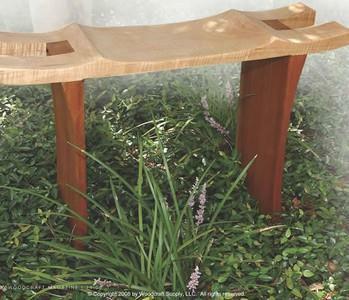 This bench has a simple design featuring assembly with mortise-and-tenon-style joinery but it will still challenge you creatively. Comfort connects with country in this knockdown design. 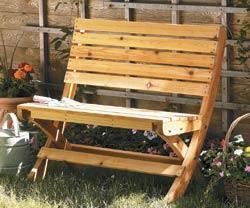 Build this traditional English style garden bench. This bench was made to be light, yet sturdy. With just a quick pull on the handle in the back of the seat, the bench folds up, so you can easily pick it up and move it.